This is the Silver and Yellow Mickey heads pin from the Brights Watches collection of 2010 Hidden Mickey Pins at WDW. This series is based upon a series of watches entitled "Brights," designed by Lindsay Voigt. This pin will only be available by trading with a cast member. This pin features A Blue Flag with a Mickey face looking to the Right. The Hidden Mickey Icon is in the top right hand corner of the pin. The pin was inspired by the Flags at the Magic Kingdom® Park. This pin is part of the 2010 Disneyland Resort/Walt Disney World Hidden Mickey Series. This five (5) pin collection features iconic designs found on Walt Disney World® Theme Park maps. This pin features the icon for Character Meet locations. Disney Trading Pin Hidden Mickey Pin Series III - Dog With Mouse Ears This pin features a stylized dog wearing a Mickey Mouse Ear Hat. It is part of a five (5) pin Pets with Mouse Ears collection. This listing is for the all silver CHASER version of pin #82372. Walt Disney World 2011 Hidden Mickey Lanyard Series - Retro Icon Collection features a sun with a face - eyes, nose, smiling mouth, and cheery cheeks. A small Hidden Mickey head icon is on the right side of the sun's face. This sun icon is from the Gran Fiesta Tour Starring The Three Caballeros attraction in Epcot's World Showcase Mexico pavilion. The sun is located on the bridge wall right before guests go into the rock caverns scene. This listing is for the all silver CHASER version of pin #82353. Walt Disney World 2011 Hidden Mickey Lanyard Series - Deebees Collection features Rocketee, dressed in a Rocket To The Moon costume. Rocketee is wearing an astronaut suit and helmet with an antenna on top. A small Hidden Mickey head icon is on his hand. Hidden Mickey Collection re-release from the WDW Cast Lanyard Series 1 Topiary (shaped foliage) Series featuring Mickey Mouse with his trademark white gloves. The right side of the pin on top reads Disney's and going down reads Topiary. The Hidden Mickey mark is located to the left of the Y in "Topiary". This listing is for the all silver CHASER version pin #82366. Walt Disney World 2011 Hidden Mickey Lanyard Series - Cute Yeti Collection featuring the Expedition Everest Yeti in a cutie form. This pin features the head of the Yeti. He has a smile on his face. He has a small Hidden Mickey head icon on his chin. Disneyland 2012 Hidden Mickey Lanyard Series - Popcorn Turner collection pin features a Main Street character turning popcorn. The gentleman is wearing a straw hat, white shirt, blue vest, and grey pants. Walt Disney World 2011 Hidden Mickey Lanyard Series - Cute Yeti Collection features the Expedition Everest Yeti in a cutie form. In this pin, the yeti is on pink skiis and holding pink ski poles. A purple and pink striped scarf is around his neck. He has a small Hidden Mickey head icon on his leg. 2011 Hidden Mickey Lanyard Series - Deebees Collection features Conductee, dressed as a railroad conductor. Conductee is wearing a grey train conductor's hat with a red circle logo in the middle that has the initials "W D" overlapping. A small Hidden Mickey head icon is on his hand. This pin will be a shared release for the 2011 Disneyland Resort and Walt Disney World Hidden Mickey Series. 2011 Hidden Mickey Lanyard Series - Deebees Collection features Rocketee, dressed in a Rocket To The Moon costume. Rocketee is wearing a grey astronaut suit and helmet with an antenna on top. A small Hidden Mickey head icon is on his hand. Disneyland 2013 Hidden Mickey Cast Lanyard Series - Mickey's Toontown Pinwheels collection pin features a baseball pitcher. The baseball player is wearing a white striped uniform, blue hat, blue shoes, and green mitt. He is getting ready to throw the baseball. Behind him is a yellow oval background. A silver hidden mickey icon is located at the bottom of the pin. Disneyland 2013 Hidden Mickey Cast Lanyard Series - Mickey's Toontown Pinwheels collection pin features a lady riding a Penny Farthing high wheeler bicycle. The lady is wearing a red leotard with pink and red striped tights. She has her hands in the air. The unicycle is brown and blue. Behind her is a blue/green oval background. A silver hidden mickey icon is located at the bottom of the pin. Disneyland 2013 Hidden Mickey Cast Lanyard Series - Mickey's Toontown Pinwheels collection pin features a lavender background with a clown wearing blue suspendered pants and a red long sleeve shirt. He appears to be juggling. A silver hidden mickey icon is located on the pin. Disneyland 2013 Hidden Mickey Cast Lanyard Series - Mickey's Toontown Pinwheels collection pin features a runner. The man is in a running pose and has wavy lines of orange for his hair. He is wearing a red pair of running shorts with a white stripe down the side, white tube socks, glasses and black and white sneakers. Behind him is a blue oval background. A silver hidden mickey icon is located at the right of the pin. Disneyland 2013 Hidden Mickey Cast Lanyard Series - Mickey's Toontown Pinwheels collection pin features a flying man. The man has a pair of crafted wings strapped to his stretched out arms. He is wearing a cream sweater, brown pants, and red scarf. Behind him is a light blue oval background. A silver hidden mickey icon is located at the bottom of the pin. Disneyland 2013 Hidden Mickey Cast Lanyard Series - Mickey's Toontown Pinwheels collection pin features an ice skater. The woman is skating with her hands behind her back and one leg in the air. She is wearing a blue sweater and tights with a purple skirt, a scarf, and a hat. Behind her is a red oval background. A silver hidden mickey icon is located at the lower left of the pin. This listing is for the all silver CHASER version of pin #95119. Disneyland 2013 Hidden Mickey Cast Lanyard Series - Mickey's Toontown Pinwheels collection pin features a clown wearing suspendered pants and a long sleeve shirt. He appears to be juggling. A silver hidden mickey icon is located on the pin. This listing is for the all silver CHASER version of pin #95158. Disneyland 2013 Hidden Mickey Cast Lanyard Series - Mickey's Toontown Pinwheels collection pin features an ice skater. The woman is skating with her hands behind her back and one leg in the air. She is wearing a sweater and tights with a skirt, a scarf, and a hat. Behind her is an oval background. A silver hidden mickey icon is located at the lower left of the pin. Disneyland 2013 Hidden Mickey Cast Lanyard Series - Wilderness Explorer collection pin features an Animal Spirit badge from the Redwood Creek Challenge Trail. This pin resembles one of badges that Russell, from the movie Up, wears. This pin is a purple circle with a yellow squirrel in the middle. A silver hidden mickey icon is located on the pin. Disney Trading Pin 94960: DLR - 2013 Hidden Mickey Series - Wilderness Explorer - Braveryrt Hidden Mickey Series. Disneyland 2013 Hidden Mickey Cast Lanyard Series - Wilderness Explorer collection pin features a Bravery badge from the Redwood Creek Challenge Trail. This pin resembles one of badges that Russell, from the movie Up, wears. This pin is a circle with a kid wearing a white shirt flexing his muscles. A silver hidden mickey icon is located on the pin. Disneyland 2013 Hidden Mickey Cast Lanyard Series - Wilderness Explorer collection pin features a Tracking badge from the Redwood Creek Challenge Trail. This pin resembles one of badges that Russell, from the movie Up, wears. This pin is a circle with Kevin's footprint track in the middle. A silver hidden mickey icon is located on the pin. Disneyland 2013 Hidden Mickey Cast Lanyard Series - Wilderness Explorer collection pin features a Wolf Howl badge from the Redwood Creek Challenge Trail. This pin resembles one of badges that Russell, from the movie Up, wears. This pin is a blue circle with a brown wolf howling at a yellow moon in the middle. A silver hidden mickey icon is located on the pin. This listing is for the all silver CHASER version of pin #94957. Disneyland 2013 Hidden Mickey Cast Lanyard Series - Wilderness Explorer collection pin features an Animal Spirit badge from the Redwood Creek Challenge Trail. This pin resembles one of badges that Russell, from the movie Up, wears. This pin is a circle with a squirrel in the middle. A silver hidden mickey icon is located on the pin. This listing is for the all silver CHASER version of pin #91282. Disneyland 2012 Hidden Mickey Lanyard Series - Popcorn Turner collection pin features a clown turning popcorn. This listing is for the all silver CHASER version of pin #91273. Disneyland 2012 Hidden Mickey Lanyard Series - Mad Tea Party collection pin features White Rabbit, from Alice in Wonderland. This red Mickey Mouse icon pin is part of the Hidden Mickey Collection. This new issue is just like the original on the front. On the back it has the 2006 Official Pin Trading logo and is marked Hidden Mickey Pin-2 of 3. Original pin is #42005. This Global Lanyard series pin features one of Daisy's nieces on a flower background. This particular one features June wearing a black shirt and a gold necklace with a blue bow in her hair and her name on the right in a purple flower. This pin has the silver hidden mickey in the lower right corner. This listing is for the all silver CHASER version pin #82364. Walt Disney World 2011 Hidden Mickey Lanyard Series - Cute Yeti Collection features the Expedition Everest Yeti in a cutie form. In this pin, the Yeti has his arms up with a scary expression on his face. He has a small Hidden Mickey head icon on his leg. This is the Silver Chaser version of Pin 82356 Walt Disney World 2011 Hidden Mickey Lanyard Series - Deebees Collection features Orangee. Orangee is orange and yellow with green leaves, characterizing Orange Bird. A small Hidden Mickey head icon is on his hand. A replica of the Peacock Parking lot sign at Animal Kingdom. Showing a silver peacock with a white feathers, above a rectangular sign which has Peacock in white letters against a green background on the top half and the lower half Has Rows 1-9 in yellow letters against a red background. It also has a small hidden Mickey. This Casey Jr. Circus Train collection pin features the circus music organ wagon. This train car is blue, purple, and red with a yellow dragon creature and a green winged dragon creature depicted. It has 4 organ pipes and the side of the car reads "Circus Special" on a white sign. At the bottom are 2 black wheels. A silver Hidden Mickey icon head is located at the top of the sign. For $1.00, with a minimum pretax $30 purchase, guests can buy one 10th Pin Trading Anniversary pin. The pins are in a small sealed black plastic bag. Which pin the guest receives is unknown until after purchase. Each of the 20 pins features a character as well as a pin trading logo with the word 10 written in various languages. The pins also contain clues as to what language ten is written in. This pin measures approx 1" across and 1" tall. Walt Disney World 2012 Hidden Mickey Lanyard Series - Star Characters collection pin features Peter Pan with orange, yellow, and green stars all around. A silver hidden mickey icon is located on the right side of the pin. This listing is for the all silver CHASER version of pin #97248. Disneyland 2013 Hidden Mickey Cast Lanyard Series - Just Got Happier collection pin features a square with Sulley's smile (face/nose/teeth/chin) and the Disneyland Resort logo. Sulley is from Monster's Inc. A silver Hidden Mickey icon is located on the pin. This Casey Jr. Circus Train collection pin features the light blue and pink car. The train car is light blue and white with a pink dragon creature and a yellow winged dragon creature depicted. At the bottom are 2 blue wheels. A silver Hidden Mickey icon is located towards the front of the car's side. Walt Disney World 2012 Hidden Mickey Lanyard Series - Compass collection pin features Lagoona Gator's head in front of a blue and white eight point star. The star is in a circle with a purple banner at the bottom that reads Walt Disney World. Lagoona Gator is the orange alligator with purple sunglasses mascot for the Typhoon Lagoon water park. A silver Hidden Mickey icon is on the right side of the pin. This listing is for the all silver CHASER version of pin #97256. This listing is for the all silver CHASER version of pin #97260. Disneyland 2013 Hidden Mickey Cast Lanyard Series - Peter Pan and Friends collection pin features Mr. Smee and Captain Hook inside a circle. A silver Hidden Mickey icon is located on the pin. Minnie is featured on the pin holding a pin trading logo with the word ten written in Italian ("DIECI")on it. She is also wearing a bow and dress in the colors of the Italian flag. This Hidden Mickey Pin features Donald Duck driving a car. It is part of a four-pin, Disney Characters Car Collection. This pin has a backstamp that says "3 of 4" and will be released November 2007. Disneyland 2011 Hidden Mickey Lanyard Series - Monorails Collection features the Mark II monorail with blue, black, and white colors with a blue windshield. Small Hidden Mickey head icon located bottom of the pin. This listing is for the all silver CHASER version of pin #97255. Disneyland 2013 Hidden Mickey Cast Lanyard Series - Disney Birds collection pin features Jose Carioca, the parrot from The Three Caballeros and Saludos Amigos, inside an oval egg shape. A silver Hidden Mickey icon is located on the pin. Disneyland 2013 Hidden Mickey Cast Lanyard Series - Just Got Happier collection pin features a blue square with Sulley's smile (face/nose/white teeth/chin) and the Disneyland Resort logo. Sulley is from Monster's Inc. A silver Hidden Mickey icon is located on the pin. Disneyland 2013 Hidden Mickey Cast Lanyard Series - Disney Birds collection pin features Vinnie, the green and white pigeon from Bolt, inside a yellow oval egg shape. A silver Hidden Mickey icon is located on the pin. Disneyland 2011 Hidden Mickey Lanyard Series - World Of Color Fountain Collection features "butterfly" the water jet fountain. Butterfly is grey, wearing a black bow tie and has orange colored water (shaped as a butterfly) projecting from the top of his head. Small Hidden Mickey head icon located in the yellow water stream. This Global lanyard series 3 pin features one of the four water squirting tikis that provoke guests that travel to WDW Adventureland in the Magic Kingdom. This particular one features a thin tiki with a beige base with a leaf on the right of him and he is squirting water towards the right on to the leaf. This pin also features the Hidden Mickey in the right hand corner of this pin. Disneyland 2013 Hidden Mickey Cast Lanyard Series - Just Got Happier collection pin features a green square with Tinker Bell's smile (face/tongue/lips/white teeth/chin) and the Disneyland Resort logo. A silver Hidden Mickey icon is located on the pin. This Cast Lanyard pin features Minnie Mouse Parasailing/Skydiving/Parachuting. It is part of a five-pin collection highlighting various recreational opportunities at the Walt Disney World® Resort. This pin has a back stamp that says “5 of 5”. This pin is part of the Cast Lanyard Collection/Series 4 at the Walt Disney World® Resort. This listing is for the all silver CHASER version of pin #97247. Disneyland 2013 Hidden Mickey Cast Lanyard Series - Just Got Happier collection pin features a square with Tow Mater's smile (face/tongue/teeth/chin) and the Disneyland Resort logo. Tow Mater is from Cars. A silver Hidden Mickey icon is located on the pin. Walt Disney World 2012 Hidden Mickey Lanyard Series - Compass collection pin features Ice Gator's head in front of a red and white eight point star. The star is in a circle with a banner at the bottom that reads Walt Disney World. Ice Gator is the blue alligator mascot for the Blizzard Beach water park. A silver Hidden Mickey icon is on the right side of the pin. 2014 Hidden Mickey Cast Lanyard Series - "It's A Small World" collection pin features Peter Pan with the British word for hello "Cheerio" . A silver Hidden Mickey icon is on the Small World character. This pin is part of both the 2014 Walt Disney World Resort and Disneyland Resort Hidden Mickey Series. This listing is for the all silver CHASER version of pin #99895. 2014 Hidden Mickey Cast Lanyard Series - "It's A Small World" collection pin features a Hawaiian boy with the Hawaiian word for hello "Aloha". The boy is wearing a lei and shorts. He is playing an ukulele. A silver Hidden Mickey icon is on the Small World character. Walt Disney World 2013 Hidden Mickey Cast Lanyard Series - Park Icons with Disney Characters collection pin features Lagoona Gator wearing sunglasses inside the silhouette of Typhoon Lagoon water park's Mount Mayday with the Miss Tilly boat resting at the peak. There is a silver Hidden Mickey icon on the left side of the pin. Walt Disney World 2013 Hidden Mickey Cast Lanyard Series - Disney Birds collection pin features Mlle. Upanova, the Dance Of The Hours Ballerina Ostrich from Fantasia, inside a purple oval egg shape. There is a silver Hidden Mickey icon towards the bottom right of the pin. Walt Disney World 2013 Hidden Mickey Cast Lanyard Series - Sweet Characters collection pin features cute Pinocchio in a cutie style with a brown square background. A silver hidden mickey icon is located in the corner of the pin. Walt Disney World 2013 Hidden Mickey Cast Lanyard Series - Sweet Characters collection pin features cute Tinker Bell in a cutie style with an orange square background. A silver hidden mickey icon is located in the corner of the pin. This Cast Lanyard pin features Donald Duck's nephew Huey. It is part of a three-pin collection; the backstamp says, "1 of 3." This pin is part of the Cast Lanyard Collection 4 at the Walt Disney World® Resort. This listing is for the all silver CHASER version of pin #97205. Walt Disney World 2013 Hidden Mickey Cast Lanyard Series - Park Icons with Disney Characters collection pin features Figment's face/head inside the silhouette of Epcot's Spaceship Earth. There is a silver Hidden Mickey icon on the left side of the pin. 2014 Hidden Mickey Cast Lanyard Series - "It's A Small World" collection pin features a Hawaiian boy with the Hawaiian word for hello "Aloha". The boy is wearing a red lei and red shorts. He is playing an ukulele. A silver Hidden Mickey icon is on the Small World character. Walt Disney World 2014 Hidden Mickey Cast Lanyard Series - Character Sketch Pads collection pin features Lightning McQueen, from Cars, on a cream animator's note pad and blue pencil. This sketch pad is from the Disney Art of Animation Resort hotel. A silver Hidden Mickey icon in the corner of the sketch pad. Walt Disney World 2014 Hidden Mickey Cast Lanyard Series - Magic Kingdom Heroes Parking Lot Signs collection pin features Woody, from Toy Story, in a round sign of blue, purple, and light blue. The bottom reads "1-10". A silver Hidden Mickey icon is on the right side of the sign. This listing is for the all silver CHASER version of pin #99897. This listing is for the all silver CHASER version of pin #91227. Walt Disney World 2012 Hidden Mickey Lanyard Series - Tonal Figment collection pin features Figment in a square with his hands up. A silver hidden mickey icon is located at the top left of the square. Features the Five legged goat that is found in the Mary Blair mural located on the fourth floor of Disney's Contemporary Resort. Disneyland Resort 2014 Hidden Mickey Cast Lanyard Series - Oswald the Lucky Rabbit Expressions collection pin features Oswald with a yelling expression with a red colored background. A silver Hidden Mickey icon is in the corner. This listing is for the all silver CHASER version of pin #91129. Walt Disney World 2012 Hidden Mickey Lanyard Series - Star Characters collection pin features Pinocchio with stars all around. A silver hidden mickey icon is located on the right side of the pin. This listing is for the all silver CHASER version of pin #94952. Walt Disney World 2013 Hidden Mickey Cast Lanyard Series - Sweet Characters collection pin features cute Pinocchio in a cutie style with a square background. A silver hidden mickey icon is located in the corner of the pin. This listing is for the all silver CHASER version of pin #99914. Disneyland Resort 2014 Hidden Mickey Cast Lanyard Series - Mater's Junkyard Jamboree Signs collection pin features Tow Mater in the Mater's Tall Tales Car Toon short Mater The Greater. This pin reads Mater The Greater and has a stripe with stars. A silver Hidden Mickey icon is in the corner. This pin is part of the 2014 Disneyland Resort Hidden Mickey Series. Disneyland Resort 2014 Hidden Mickey Cast Lanyard Series - Character Tiki Faces collection pin features a tiki mask of Donald Duck. A silver Hidden Mickey icon is in the corner. Disneyland Resort 2014 Hidden Mickey Cast Lanyard Series - Mater's Junkyard Jamboree Signs collection pin features Tow Mater in the Mater's Tall Tales Car Toon short Mater The Greater. This pin reads Mater The Greater and has a red background and a blue stripe with white stars. A silver Hidden Mickey icon is in the corner. Disneyland Resort 2014 Hidden Mickey Cast Lanyard Series - Mater's Junkyard Jamboree Signs collection pin features Tow Mater in the Mater's Tall Tales Car Toon short Air Mater. This pin features the Air Squad crest with an airplane formation and a lightning bolt. At the bottom of the pin is a banner that has Mater's nickname "Mater Hawk". A silver Hidden Mickey icon is in the corner. Disneyland Resort 2014 Hidden Mickey Cast Lanyard Series - Mater's Junkyard Jamboree Signs collection pin features Tow Mater in the Mater's Tall Tales Car Toon short Heavy Metal Mater. Mater is standing on a mountain like rock and has wings, he is meant to resemble Chernabog. A silver Hidden Mickey icon is in the corner. This listing is for the all silver CHASER version of pin #99924. Disneyland 2011 Hidden Mickey Lanyard Series - World Of Color Fountain Collection features "Single Water Whip" the water jet fountain. Single Water Whip is grey, has long eyelashes, and is wearing a necklace. She has pink colored water projecting from the top of her head. Small Hidden Mickey head icon located in the pink water stream. Disneyland Resort 2014 Hidden Mickey Cast Lanyard Series - Disney California Adventure Tile Window Mural collection pin features a Spanish woman flamenco dancing. This mural is outside of the Carthay Circle restaurant. A silver Hidden Mickey icon is in the corner. Disneyland Resort 2014 Hidden Mickey Cast Lanyard Series - Oswald the Lucky Rabbit Expressions collection pin features Oswald with an upset expression with a purple colored background. A silver Hidden Mickey icon is in the corner. Disneyland Resort 2014 Hidden Mickey Cast Lanyard Series - Disney California Adventure Tile Window Mural collection pin features a housing community with a mountain range in the background. This mural is outside of the Five and Dime shop. A silver Hidden Mickey icon is in the corner. Disneyland 2011 Hidden Mickey Lanyard Series - World Of Color Fountain Collection features "Dual Water Whip" the water jet fountain. Dual Water Whip is grey, has a black bow tie, and has his teeth showing. He has green colored water projecting from the top of his head. Small Hidden Mickey head icon located in the pink water stream. This listing is for the all silver CHASER version of pin #102299. Disneyland Resort 2014 Hidden Mickey Cast Lanyard Series - Villainous Sidekicks collection pin features Smee, from Peter Pan, saluting. The background frame is a life preserver. A silver Hidden Mickey icon is located on the pin. Disneyland Resort 2014 Hidden Mickey Cast Lanyard Series - Oswald the Lucky Rabbit Expressions collection pin features Oswald with a confused expression with a blue colored background. A silver Hidden Mickey icon is in the corner. This global lanyard series 3 pin released at WDW shows Tinker Bell reclining on her stomach against a background of a red sky with orange clouds, and a pink/peach-coloured sun behind her. There is a silver hidden Mickey on the bottom corner of the pin. These pins can only be obtained by trading with Cast Members from their lanyards. This listing is for the all silver CHASER version of pin #102304. Disneyland Resort 2014 Hidden Mickey Cast Lanyard Series - Disney Birds collection pin features Donald Duck, in his Three Caballeros sombrero hat, inside an oval egg shape. Donald is holding up 3 fingers. There is a silver Hidden Mickey icon on the pin. Disneyland Resort 2014 Hidden Mickey Cast Lanyard Series - Alice in Wonderland Teapots collection pin features a teapot in the style of Mad Hatter. The teapot is designed with Mad Hatter's hat with the 10/6 price tag, his green bowtie, his yellow jacket coat, and green vest and pants. A silver Hidden Mickey icon is located on the right side of the pin. This listing is for the all silver CHASER version of pin #102292. Disneyland Resort 2014 Hidden Mickey Cast Lanyard Series - Deck of Cards collection pin features the Evil Queen, from Snow White and the Seven Dwarfs, on the "Queen" playing card. A silver Hidden Mickey icon is located in the top right corner of the pin. Disneyland Resort 2014 Hidden Mickey Cast Lanyard Series - Disney Birds collection pin features Clara Cluck, the hen, inside a pink oval egg shape. She is also wearing her blue hat with white feather. There is a silver Hidden Mickey icon on the pin. Disneyland Resort 2014 Hidden Mickey Cast Lanyard Series - Villainous Sidekicks collection pin features Iago, from Aladdin. The background frame is the purple Magic Carpet with its yellow tassels. A silver Hidden Mickey icon is located on the pin. This listing is for the all silver CHASER version of pin #102288. NOTE: Instead of the usual all silver version chaser, this pin just features a different color. So all of the green parts of the regular version of the pin are black on this chaser pin. Disneyland Resort 2014 Hidden Mickey Cast Lanyard Series - Chalk Sketches collection pin features a sketch of Jiminy Cricket, from Pinocchio, on a black chalkboard. A silver Hidden Mickey icon is located in the corner of the pin. Disneyland 2011 Hidden Mickey Lanyard Series - World Of Color Fountain Collection features "Chaser" the water jet fountain. Chaser is grey, wearing a black bow tie and has yellow colored water projecting from the top of his head. Small Hidden Mickey head icon located in the yellow water stream. Walt Disney World 2012 Hidden Mickey Lanyard Series - Star Characters collection pin features Baloo, from the Jungle Book, with white, brown, and orange stars all around. A silver hidden mickey icon is located on the left side of the pin. Disneyland Resort 2014 Hidden Mickey Cast Lanyard Series - Mater's Junkyard Jamboree Signs collection pin features Tow Mater in the Mater's Tall Tales Car Toon short El Materdor. Mater is dressed as matador and has a red cape. A silver Hidden Mickey icon is in the corner. This global lanyard series 3 pin released at WDW shows Minnie peering out of the brush with butterfly net in hand smiling at the pink butterfly on her hat brim. There is a silver hidden mickey on the bottom corner of the pin. These pins can only be obtained by trading with Cast Members from their lanyards. WDW Cast Lanyard Series - Pan's The Man! Disney Trading Pin 13481: WDW Cast Lanyard Series - Pan's The Man! This listing is for the all silver CHASER version of pin #102275. Walt Disney World 2014 Hidden Mickey Cast Lanyard Series - Disney Birds collection pin features Big Mama, the owl from Fox and the Hound, inside an oval egg shape. There is a silver Hidden Mickey icon on the pin. Disneyland 2007 Hidden Mickey Lanyard Pins - Fairy Collection features Lily with Flowers. Small Mickey head icon on the bottom. Walt Disney World 2014 Hidden Mickey Cast Lanyard Series - Character MagicBands collection pin features a MagicBand in the style of Figment. The band is purple and has Figment's body in the middle. It shows Figment's purple body, pink belly, and orange wings, horns, feet, and hands. A silver Hidden Mickey icon is on the lower side of his body. Walt Disney World 2014 Hidden Mickey Cast Lanyard Series - Character MagicBands collection pin features a MagicBand in the style of Chip. The band is brown and has Chip's body in the middle. It shows Chip's brown body and black nose. A silver Hidden Mickey icon is on the lower side of his body. This listing is for the all silver CHASER version of pin #102257. Walt Disney World 2014 Hidden Mickey Cast Lanyard Series - Princess Mobile Phone collection pin features Jasmine, the princess from Aladdin, on a cell phone. The pin has her name and says calling... A silver Hidden Mickey icon is on the bottom of the pin. This listing is for the all silver CHASER version of pin #102263. Walt Disney World 2014 Hidden Mickey Cast Lanyard Series - Character MagicBands collection pin features a MagicBand in the style of Figment. The band has Figment's body in the middle. It shows Figment's belly, wings, horns, feet, and hands. A silver Hidden Mickey icon is on the lower side of his body. This pin is part of Cast Lanyard Series #3 at WDW, and is part of a sub-set featuring the Epcot parking signs with Figment. Here, Figment is shown in front of a dark blue colored Spaceship Earth. A large "J" is on the pin along with the parking section "Journey" and the rows "1-6". A hidden mickey is in the lower-right hand corner of the pin. This listing is for the all silver CHASER version of pin #91130. Walt Disney World 2012 Hidden Mickey Lanyard Series - Characters Sleeping collection pin features Donald Duck sleeping on some pillows. Donald is dressed in a night shirt and cap. A silver hidden mickey icon is located on the lower side of a pillow. This pin is part of the 2012 Walt Disney World Resort Hidden Mickey Series. Walt Disney World 2014 Hidden Mickey Cast Lanyard Series - Princess Mobile Phone collection pin features Cinderella, the princess from Cinderella, on a black cell phone. The pin has her name and says calling... A silver Hidden Mickey icon is on the bottom of the pin. This pin is part of the 2014 Walt Disney World Resort Hidden Mickey Series. DLR's 2015 Hidden Mickey Wave A - Disney Ducks - Ludwig Von Drake. He is wearing a blue jacket with a rust vest and a black tie. His white shirt collar sticks above his jacket and comes together under his chin. He is looking toward the right. His eyes are light blue with a black pupil and his spectacles are sitting on his bill. His mouth is open and the interior is rust. The background is red. There is a silver hidden mickey above his left shoulder. This listing is for the all silver chaser version of pin #108627. DLR 2015 Hidden Mickey Wave A - Disney Ducks featuring Ludwig Von Drake. A silver hidden mickey icon is on the left side of the pin above his shoulder. From the movie The Jungle Book, we have Kaa dangling from a tree limb in front of Mowgli. Don't look into his eyes, Mowgli. They are on a green background with a silver hidden mickey under Kaa. Dopey (from Snow White and the Seven Dwarfs) is shown here climbing the stairs holding a candle. He is on a green background and there is a silver hidden mickey in front of him. This global lanyard series 3 pin released at DLR shows Tinker Bell just waking up from a good night's sleep. She's stretching against a background of green and blue with a large yellow sun just coming up over the horizon - her hands are on top of her head, and her eyes are closed. 2015 Wave B Hidden Mickey for the Walt Disney World Resort. Alana, one of Ariel's sisters from the movie The Little Mermaid is pictured on this all silver chaser. A hidden mickey is on the right side of her face. 2015 Wave B Hidden Mickey for the Disneyland Resort. This tea cup from the Mad Tea Party attraction is burgundy. A hidden mickey is located on the upper right. Other pins in the series include: 111945, 111946, 112041, 112207, 112216. DLR's 2015 Hidden Mickey Wave B - Mardi Gras - Chip and Dale. Dressed as jesters. Chip on right with purple blue jester hat with red balls on end and Dale with pink, purple, blue and red. 2015 Hidden Mickey Wave B Disneyland Resort. Diamond shaped with Flora, from the movie Sleeping Beauty, wearing her usual pink. There is a Hidden Mickey icon on the right side of the pin. The diamond is done in two tones of blue which make up the diamond shape of the pin. There are two different sets of HM diamond pins celebrating DLRs 60th Anniversary (Attractions and Characters). Wave B 2015 Hidden Mickey at Disneyland Resort - Horse Drawn Streetcar. Two toned blue diamond background with red, yellow, gray, and black streetcar with horse. There is a silver hidden mickey on the right above the horse. Walt Disney World 2015 Hidden Mickey Cast Lanyard Series - EPCOT Center Logos collection pin features the green and white wave logo for The Living Seas. A silver Hidden Mickey icon is left side of the pin. This pin is part of the 2015 Walt Disney World Resort Hidden Mickey Series. Walt Disney World 2015 Hidden Mickey Cast Lanyard Series - EPCOT Center Logos collection pin features the green and white leaf logo for The Land. A silver Hidden Mickey icon is left side of the pin. This pin is part of the 2015 Walt Disney World Resort Hidden Mickey Series. This pin features Snow White from "Snow White and The Seven Dwarfs" looking into a red rearview mirror with her name on it - you can see her eyes. This is a Hidden Mickey Cast Lanyard pin available by trade with a Cast Member in one of the parks. Walt Disney World 2015 Hidden Mickey Cast Lanyard Series - Character Sidekicks collection pin features Meeko the raccoon, from Pocahontas, inside an orange diamond shape. A silver Hidden Mickey icon is on the side of the pin. This pin is part of the 2015 Walt Disney World Resort Hidden Mickey Series. Hidden Mickey 2015 Wave B Disneyland Resort. Minnie is dressed for Mardi Gras wearing a pink mask with yellow and pink feathers. There is a Hidden Mickey present on a feather on the right. Hidden Mickey 2015 Wave B Disneyland Resort. This all silver chaser features Wendy Darling flying. Back: Hidden Mickey Pin 9 of 10, Authentic Official Pin Trading 2015 Disney Parks © Disney Made in China. There are two different sets of HM diamond pins celebrating DLRs 60th Anniversary (Attractions and Characters). 015 Wave B Hidden Mickey for the Walt Disney World Resort. The Genie from Aladdin is wearing a beige top hat with a red band and a tuxedo with a red cumberbund and a white dickey collar. His gold lamp is in front of him and a silver hidden mickey is centered on it. It has a mint green background. Aladdin Genie Hidden Mickey Pins are 112170, 112171, 112172, 112173, 112174. Chaser is 112147. 2015 Wave B Hidden Mickey for the Walt Disney World Resort. This is the Genie from Aladdin. He is dancing with a Top Hat and Cane. He is holding his top hat above his head with his left hand and his cane is resting on his right shoulder (it has a white bottom). His gold lamp is in front of him and a silver hidden mickey is centered on it. The background is dark pink. Aladdin Genie Hidden Mickey Pins are 112170, 112171, 112172, 112173, 112174. Chaser is 112147. 2015 Wave B Hidden Mickey for the Walt Disney World Resort. This is the silver Genie with Top Hat Chaser. Genie is seen in the movie Aladdin. Aladdin Genie Hidden Mickey Pins are 112170, 112171, 112172, 112173, 112174. Chaser is 112147. 2015 Wave B Hidden Mickey for the Walt Disney World Resort. This is the Genie from the movie Aladdin. He is holding a comb in one hand that is lifting Aladdin's hair and partially cutting it. In his other hand he has scissors cutting across Aladdin's hair. Aladdin is wearing a pink cape and has shaving cream on his face. His gold lamp is in front of him and a silver hidden mickey is centered on it. It has a burgundy background. Aladdin Genie Hidden Mickey Pins are 112170, 112171, 112172, 112173, 112174. Chaser is 112147. 2015 Wave B Hidden Mickey for the Walt Disney World Resort. This is the silver Disney Dragons Figment Chaser. The silver hidden mickey is on the left side of the pin. Disney Dragons Hidden Mickey Pins are 112164, 112165, 112166, 112167, 112168. Chaser is 112148. 2015 Wave B Hidden Mickey for the Walt Disney World Resort. This is the Spacesuit, which is green, Donald Duck. The silver hidden mickey is on his left boot. Hidden Mickey Pins are 112154, 112155, 112156, 112157, 112158. Chaser is 112146. This pin is one of a new series of Cast Lanyard pins that are being released in September. Minnie Mouse is featured here wearing a red, white and blue bikini and saluting while sunning herself under the sun. 2015 Wave B Hidden Mickey for the Disneyland Resort. Arista, one of Ariel's sisters from the movie The Little Mermaid. She is wearing a fuchsia mermaid dress with matching headband on a pink seashell. There is a silver hidden mickey on the seashell on the left. 2015 Wave B Hidden Mickey for the Disneyland Resort. Andrina, one of Ariel's sisters from the movie The Little Mermaid is pictured on a dark blue shell. A hidden mickey is on the right side of her face. She is wearing a pink crown. 2015 Wave B Hidden Mickey for the Disneyland Resort. Alana, one of Ariel's sisters from the movie The Little Mermaid is pictured on a yellow shell. A hidden mickey is on the right side of her face. She is wearing a pink crown. 2015 Wave B Hidden Mickey for the Disneyland Resort. Jungle Cruise boat on a two toned blue diamond shaped background. There is a hidden Mickey above the boat. There are two different sets of HM diamond pins celebrating DLRs 60th Anniversary (Attractions and Characters). Pins in this collection include: 111947, 112044, 111948, 112220, 112219. Chaser: 112229. LR's 2015 Hidden Mickey Wave B - Mardi Gras - Stitch chaser. All silver chaser with Stitch wearing jester hat. There is a silver hidden mickey on the right side of hat. Back: Hidden Mickey Pin 7 of 10, Authentic Official Pin Trading 2015 Disney Parks, © Disney Made in China. Pins in this collection include: 112198, 112199, 112205, 112116, 111943. Chaser: 111950. 2015 Wave B Hidden Mickey for the Disneyland Resort. An older green version of a car from Autopia is being driven by a silhouetted girl. It is shown on a two-toned blue diamond. A hidden mickey is on the right side. There are two different sets of HM diamond pins celebrating DLRs 60th Anniversary (Attractions and Characters). Pins in this collection include: 111947, 112044, 111948, 112220, 112219. Chaser: 112229. Hidden Mickey 2015 Wave B Disneyland Resort. Disneyland Railroad Train Engine. Two toned blue diamond background with red, yellow, gray, and black train engine with silver wheels. There is a silver hidden mickey on the right in front of engine. Back: Hidden Mickey Pin 2 of 5, Authentic Official Pin Trading 2015 Disney Parks © Disney Made in China. There are two different sets of HM diamond pins celebrating DLRs 60th Anniversary (Attractions and Characters). Pins in this collection include: 111947, 112044, 111948, 112220, 112219. Chaser: 112229. 2015 Wave B Hidden Mickey for the Walt Disney World Resort. A black traditional earhat with the red circle around Mickey. Tinker Bell is behind the hat and her hands are holding each ear. A silver hidden mickey is on the left. Earhat Hidden Mickey Pins are 112159, 112160, 112161, 112162, 112163. Chaser is 112144. This Cast Lanyard pin features a Red Mickey Mouse silhouette in a round circle. It is part of a three-pin collection/series; the backstamp says, "2 of 3." This pin is part of the Cast Lanyard Collection 4 at the Walt Disney World® Resort. There is a small Mickey head on the lower right side of the circle. Part of The New hidden Mickey Series III for 2008 Pin was released at the PTU Event at WDW Epcot in September 2008. This pin features a stylized cat wearing a Mickey Mouse Ear Hat. Part of The New hidden Mickey Series III for 2008 Pin was released at the PTU Event at WDW Epcot in September 2008. This pin features a stylized bird wearing a Mickey Mouse Ear Hat. It is part of a five (5) pin Pets with Mouse Ears collection. Disneyland Cast Lanyard Series 4 Fairies Collection features Fira the fairy on a green leaf with her name bellow and a small Mickey head icon on the left. 4 of 7. Pin is 1 1/4" tall by 1" wide. This Lanyard Series 2 pin is one of the Safari series within that series, showing black & white photographs from the safari. Donald Duck is featured under an elephant. The pin measures 1 1/4" (3.3 cm) wide by 1 1/8" (2.8 cm) tall. This pin is from the second series WDW cast lanyard pins. This pin features a photograph of Donald Duck on his back due to his backpack being to heavy. There is also a laughing hyena on the side. Looks like a black & white picture. Pin measures 1 1/4 inches by 1 inch in size. Disneyland 2012 Hidden Mickey Lanyard Series - Crest collection pin features Mickey Mouse's head on a red crest shield. At the top of the crest is a crown. At the bottom is a blue banner that reads "Disneyland Resort". A silver Hidden Mickey icon is at the top of the pin. This listing is for the all silver CHASER version of the Walt Disney World/ Disneyland Resort 2017 Hidden Mickey Wave A Shared Release – Smiling Disney Villains pin – Ursula from The Little Mermaid. The square pin features the bottom half of her smiling face with only her nose, lips, teeth, and double chin. A silver Hidden Mickey icon is on the lower left. Walt Disney World/ Disneyland Resort 2017 Hidden Mickey Wave A Shared Release – Smiling Disney Villains pin. The square pin features Ursula, from The Little Mermaid. The bottom half of her purple smiling face is pictured with only her nose, lips, teeth, and double chin. A silver Hidden Mickey icon is on the lower left. This listing is for the all silver CHASER version of the Disneyland 2017 Hidden Mickey Wave A – Fruit Icons pin – Strawberry Minnie Head Icon with a bow. A Hidden Mickey icon is on the left bottom. Disneyland 2017 Hidden Mickey Wave A- Fruit Icons pin. Pin is a Kiwi Fruit Minnie Head Icon with a pink bow. A silver Hidden Mickey icon is on the lower right. Disneyland 2017 Hidden Mickey Wave A- Fruit Icons pin. Pin is an Orange (the fruit) Minnie Head Icon with a turquoise bow. A silver Hidden Mickey icon is on the lower left. Disneyland Resort 2017 Hidden Mickey Wave A- Fruit Icons pin. Pin is a Strawberry Minnie Head Icon with a green bow. A Hidden Mickey icon is on the lower left. Disneyland 2017 Hidden Mickey Wave A – The Jungle Book Characters pins. The pin is leaf shaped and features a picture of Bagheera, the panther. A silver Hidden Mickey icon is on the lower left. This listing is for the all silver CHASER version of the Disneyland 2017 Hidden Mickey Wave A Jungle Book Characters – Baloo pin. It is leaf shaped with a outline of Baloo in silver with a Hidden Mickey icon on the lower left. Walt Disney World/ Disneyland Resort 2017 Hidden Mickey Wave A Shared Release – Smiling Disney Villains pin. The square pin features Captain Hook, from Peter Pan. The bottom half of his smiling face is pictured with only his nose, mustache, teeth, and chin. A silver Hidden Mickey icon is on the lower left. Disneyland 2017 Hidden Mickey Wave A – Signs pins. The pin is a replica of the Mens restroom sign in Tomorrowland near Space Mountain. The silver pin is round at the top with orange square cutouts at the top and on the sides it has rivet holes around it. In the middle is a blue circle with a male robot picture in white. Beneath him is a blue oval with the word Men written in silver. A silver Hidden Mickey icon is on the left of the robot. This listing is for the all silver CHASER version of the Disneyland 2017 Hidden Mickey Wave A Signs pin – Adventureland Enchanted Tiki Room Mens Room. It is a triangle shaped pin with a witch doctor mask and the word Men below it. A Hidden Mickey icon is on the left bottom. This WDW Global Lanyard pin features one of the Hitchhiking ghosts from the Haunted Mansion ride. This particular one features the Prisoner also known as Gus. All the ghosts are various shades of blue and all feature the Hidden Mickey. This pin is part of the WDW Global Lanyard Series. Disneyland 2017 Hidden Mickey Wave A – The Jungle Book Characters pins. The pin is leaf shaped and features a picture of Kaa, the snake, with his hypnotic eyes on a green background. A silver Hidden Mickey icon is on the lower right. Disneyland 2017 Hidden Mickey Wave A – The Jungle Book Characters pins. The pin is leaf shaped and features a picture of King Louie, the orangutan on a rust background. A silver Hidden Mickey icon is on the lower right. Disneyland 2017 Hidden Mickey Wave A – The Jungle Book Characters pins. The pin is leaf shaped and features a picture of Baloo the bear. A silver Hidden Mickey icon is on the lower left. Disneyland 2017 Hidden Mickey Wave A – Signs pins. The round shaped pin is a replica of the women’s restroom sign in Adventureland near the Enchanted Tiki Room. It features a female Tiki on a light yellow background with a dark yellow patterned border. Below her is the word Women. A Hidden Mickey icon is on her left. Part of The New hidden Mickey Series III for 2008 Pin was released at the PTU Event at WDW Epcot in September 2008. 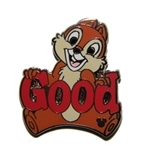 This pin features a cartoon son wearing a Mickey Mouse Ear Hat. It is part of a five (5) pin Family with Mouse Ears collection.